When a Spell/Trap Card, or monster effect, is activated in this card’s column, while this card is Set: Negate the activation, and if you do, destroy that card. Broken Line would be useful even without Link Format. Counter Trap that negates an effect of any kind that occurs in its column, and destroys that card. Great, easy effect that any deck can use. If you go first, this card is going to likely stay in your hand until you can set your opponent up. Nine times out of 10 this card is going to get payment for you using it. No LP cost, no discard, no clause aside from lining it up in the same column as a card your opponent controls…this card could be run in 3’s in any deck. The destruction of the card it negates may set off a destruction effect, but that would happen with most cards you would use in place of this card. I can’t see why this card wouldn’t be played in every deck if the deck had space for at least one. Monster effects, gone. Spell and trap effects, negated and destroyed. Cards that activate on the field (already face-up), bye-bye. I love this card, and I could see it becoming something. Side Deck option sure, Main Deck option? Maybe. The idea of stopping a Solemn Warning for free because they set in the same column as me because they weren’t expecting this? That changes how players place EVERY card, not just monsters. I love a balanced card. Broken Line is a Counter Trap Card that can negate and destroy any Spell, Trap, or Monster Effect if it’s in the same column as Broken Line. So right off the bat, you would not want to try to activate this from your hand because it needs to be set. Also, it will never negate Field Spells. But a Counter Trap that is free that is always a 1 for 1 is absolutely a must run. It’s also a card that needs to be played around if you know your opponent is running it. This will always be useful no matter what format, so it will always score this high. A noteworthy thing about Circuit Break is that we are seeing some of the first column support since its debut in Cyberdark Impact, only now columns are relevant because of Link Monsters, and we got an actually solid column card in Broken Line. Broken Line is a Counter Trap that can negate a Spell/Trap or monster effect that is activated in the same column as this card. This is hard to mess with turn one as your opponent has nothing on the field and you don’t know where they will play their cards. Maybe in the column of the Extra Monster Zone that isn’t occupied if you already occupied the first one. 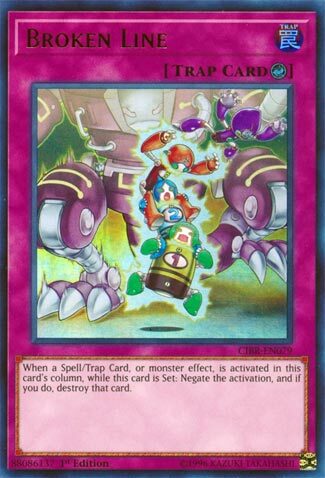 The card is hard to play, but can pay off if you are able to stop the right effect, also can stop Magical Musketeers if you set this in the column of one of their monsters since they are likely to use a Spell or Trap in the column of that monster. Broken Link just screams Tech and/or Side-Deck to me. This all seems so simple, when a Magic/Trap card is activated, or a Monster Effect, you can negate the activation, and destroy the card if you’re successful. Said card has to be in the same column as this card, but with Pendulum and Link cards around, that only makes this card more viable I feel. It’s a smart card that also involves some luck, and probably patience too. It won’t be game breaking, at least not every time, but the payoff can be huge when it is.